Typical British Bank Holiday Monday - RAIN!!! 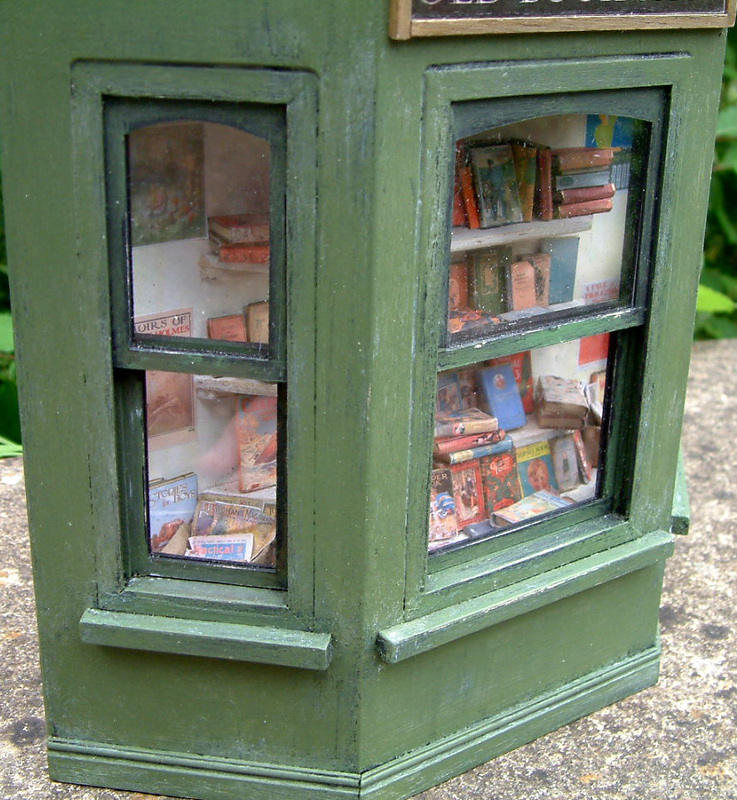 I would just like to give a warm welcome to the few new followers who have joined KT Miniatures Journal over the past 3-4 weeks. Hello to you and hope you enjoy it here. Ok... 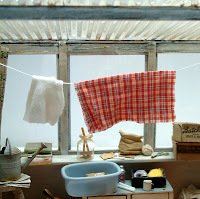 I decided to take a day off today away from KT Miniatures workbench (yep....Bank Holiday here again in the UK) but typical.....it has chucked it down literally all day. 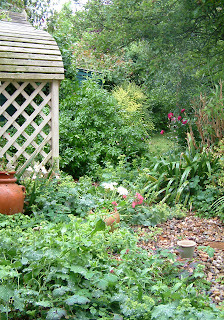 However, shouldn't complain really as our gardens are all so lacking in rain that we are in desperate need of some of the wet stuff . Undaunted, I dug out my tatty old blue plastic mac (famous for being on Midsommer Murders but that is another story)!! !lol....and spent an entire wonderful day gardening in the rain. I can highly recommend it - is very therapeutic.... even if I then did manage to trudge loads of muddy footprints right through the house without realising-ooops!!! 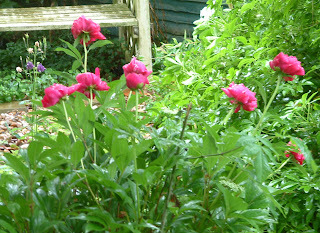 I couldn't resist taking a photo of my peony in the rain....I never saw it flower at all the previous summer. Basically I was away for all of the half term holiday week last year and missed the peony flowering for its entire short life...so today, I am making the most of it! I know this has absolutely nothing to do with miniatures but what the heck - just humour me!! 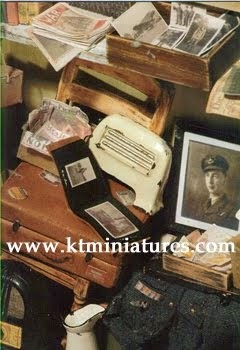 KT Miniatures will be back to normal tomorrow and open for business once more. I have some more lovely vintage treasures plus some vintage style handmade pieces to add to the website over the next few days....but more news about those another time. I may have been a little quiet these past few days but have been beavering away on all sorts of projects up in the workroom! 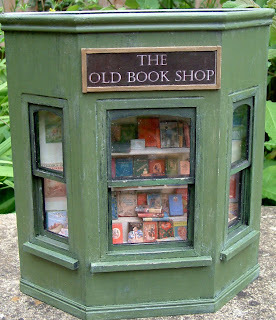 One of the "new" creations is now complete and today has been put up for sale on KT Miniatures - a little secondhand book shop front, similar to one that I have made before but slightly different in design, colour and contents. In fact this one, unlike the previous shop front, has an aged painted finish - to give the impression of a slightly neglected old shop. 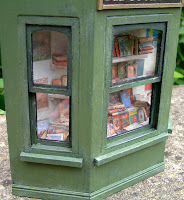 This little room box is crammed full with tiny replicas of real books mostly from the 1920s-1940s. 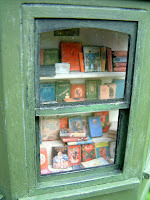 The three sash windows open fully so whoever purchases this can add to the shelves if they wish. 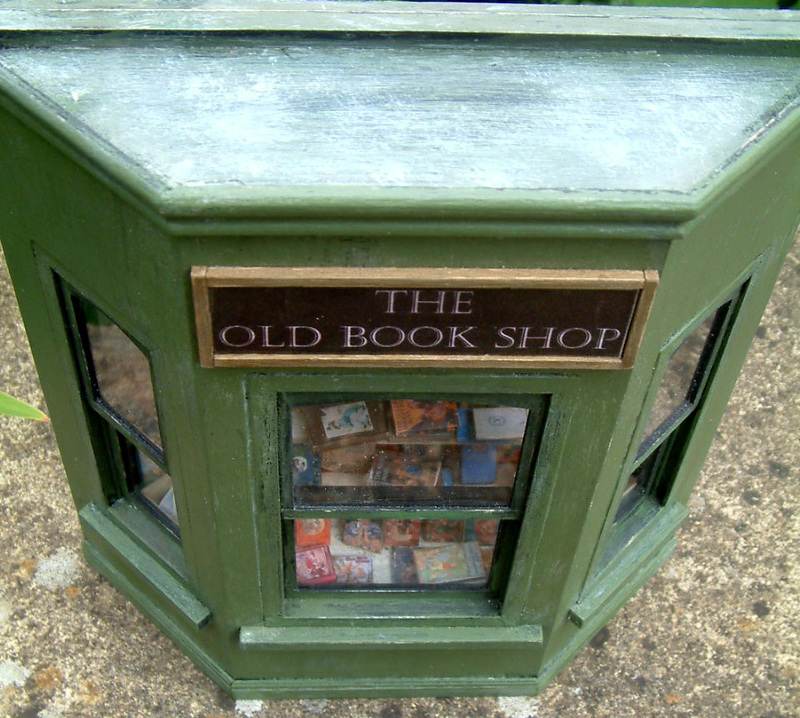 Personally I am a sucker for old books and can literally spend hours scouring the nooks and crannies of old secondhand bookshops. With this little scene I have tried to capture the essence of these wonderful old musty places. Many of you may recognise some of the children's books? 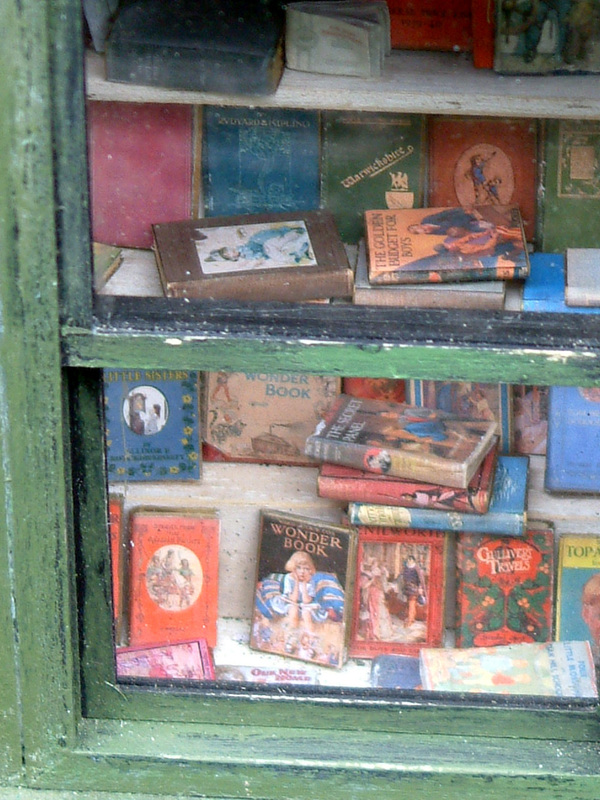 Yep...tucked away is a 1930s aged Gold Wonder Book, Gullivers Travels, Arthur & The Knights, Black Beauty etc....... in fact there are well over 60 books in total! This is very compact and can easily sit on a shelf, a mantlepiece or be hung on the wall. Could make an ideal present for someone. 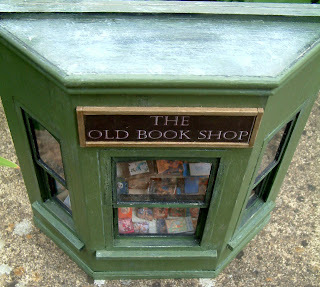 Unlike many of my larger projects, this little shop front can be posted overseas. Every so often a customer tells me of a special miniatures event/project that they are involved in and I am always pleased to "spread the word"! Today I am delighted to let you know of a wonderful event that might be a few months away yet but if you are planning on going to Jersey for a holiday, you may like to take special note. Barbara Kendall-Davies whose name you might well recognise if you are an ardent opera fan or indeed follower of KT Miniatures Old Dolls House Gallery, has forwarded me details of their Jersey Dolls House & Miniatures Club Exhibition which is taking place on Sunday 21st August 2011 from 10.00am - 5.00pm at St. Brelades's Parish Hall, St. Aubin's Harbour, Jersey. All proceeds will be in aid of two charities- Help The Heroes and Motor Neurone Society. 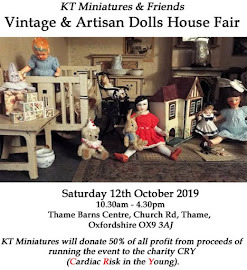 The theme is market stalls and there will be dolls houses and room boxes on show plus a competition with questions based on the objects in the exhibition. There will also be a sales table with handmade miniatures and a raffle with a variety of prizes, as well as refreshments and home-made cakes. So if you are in that area during August....do go along. Barbara herself is a collector of vintage dolls houses, has a HUGE collection of dolls houses and miniatures, is a retired opera singer,biographer of Pauline Viardot Garcia plus as you can see from the painting...a very talented artist too! 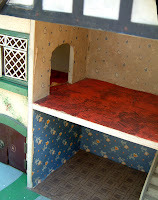 In a mad moment, I decided to create a promotional video for my Old Dusty Attic Room which is currently for sale on KT Miniatures website. The video is a bit of an experiment but have had great fun "playing" with all the different effects & buttons......hope you like it! Phew..have even managed to get it on YouTube! 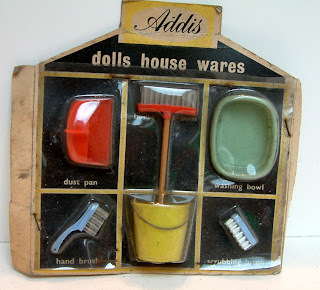 Many of you will probably be familiar with these little Addis items. 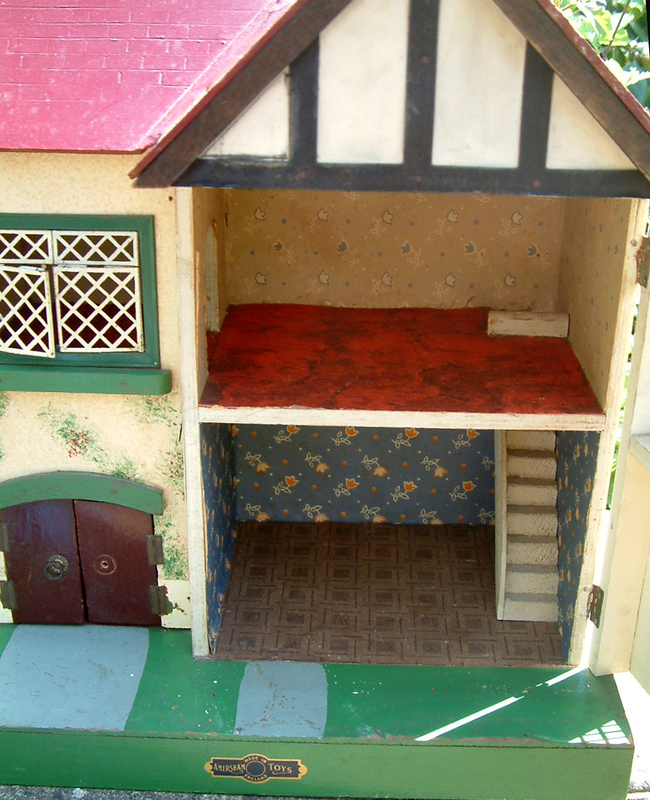 I suspect that quite of few of us in the UK would have had these in our 1960s childhood dolls houses. 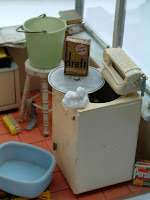 I certainly did and remember many a time happily sweeping and cleaning my dolls house floor with them. (Sad isn't it?) Mind you....I bet loads of you out there did the same! Although primarily manufactured for the 1/16th scale dolls house market in the 1960s, they would be perfectly suitable in a modern 1/12th scale reproduction dolls house. Just goes to show how really good traditional design can keep going through decades and still be in fashion all these years later. I seem to remember when we got married in the late 1970s we were given a real life sized Addis kitchen set for a wedding present that was used for years right up until the 1990s. 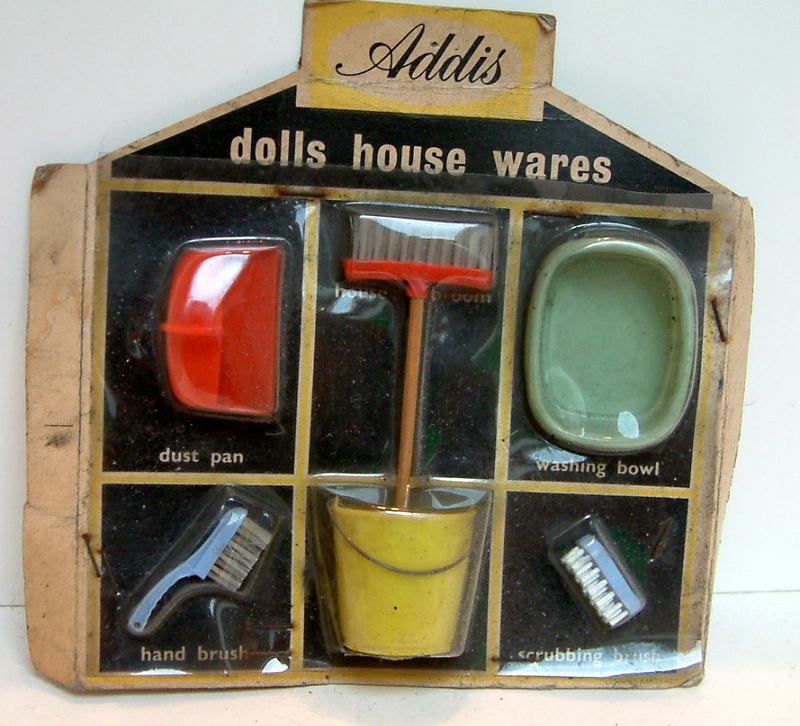 There are six boxed Addis sets currently for sale - all old shop stock. I say boxed, it's more of a packet and the items are enclosed inside under the plastic, completely untouched since their manufacture back in the 1960s. The set consists of a plastic bucket with wire handle, plastic dustpan & brush, plastic scrubbing brush, plastic broom & washing up bowl - all with "Addis" embossed somewhere on them. The bristles on the brushes are nylon and the broom handle is wooden. 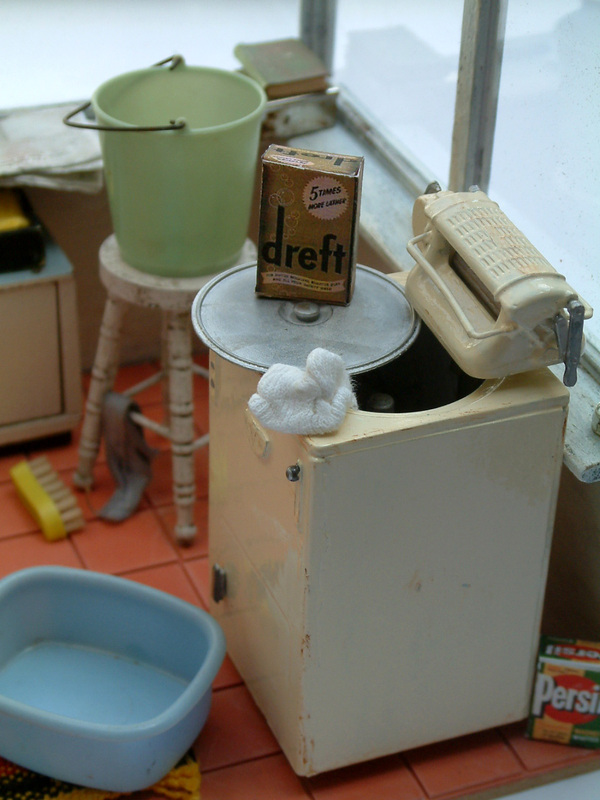 You can see here from a past 1950s Lean-To 1/12th scale project, how useful some of these Addis items are ...they look quite at home. 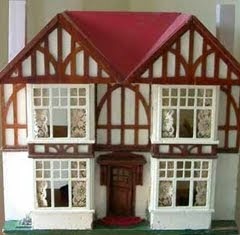 This very sweet little 1950s Amersham dolls house has just arrived in at KT Miniatures, all in original condition. You can see from the little name plate above the door that this house is called "Uplands". 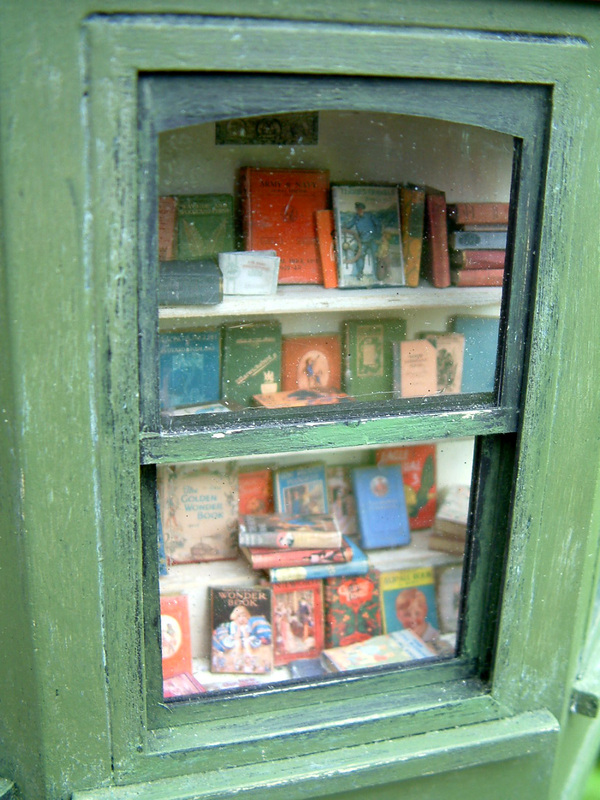 It is of wooden construction and still has all the metal opening windows intact which is nice - the sort that are totally unique to Amersham dolls houses. 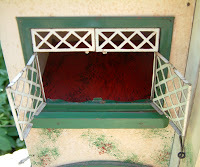 Each window opens from either the left or the right and there is a fixed top panel above each one of them. There is a room downstairs with a staircase leading up to another room plus a tiny archway leading into a smaller room above a garage. 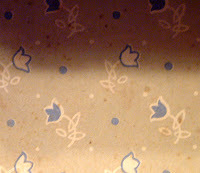 The wallpaper and flooring are original to the house which is great to see - so often these little vintage houses are redecorated as they pass through each generation. 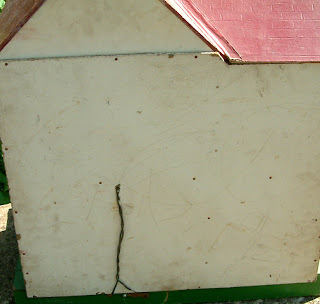 This has come direct from the previous owner who had this as a child. 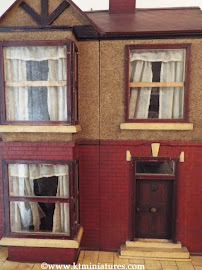 On this 1950s model house the label has been painted/stencilled and is fully intact on the front of the base which again is great to see. 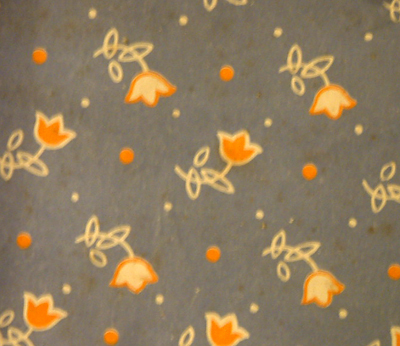 This floral patterned wallpaper above was commonly used in these Amersham 1950s model houses. I have taken a close up photo of each to help you identify this in your own vintage dolls house. 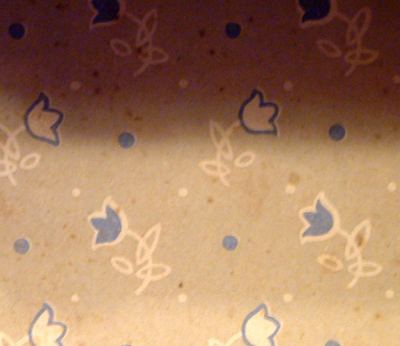 It is so difficult sometimes to tell whether wallpaper is original to an old house isn't it? 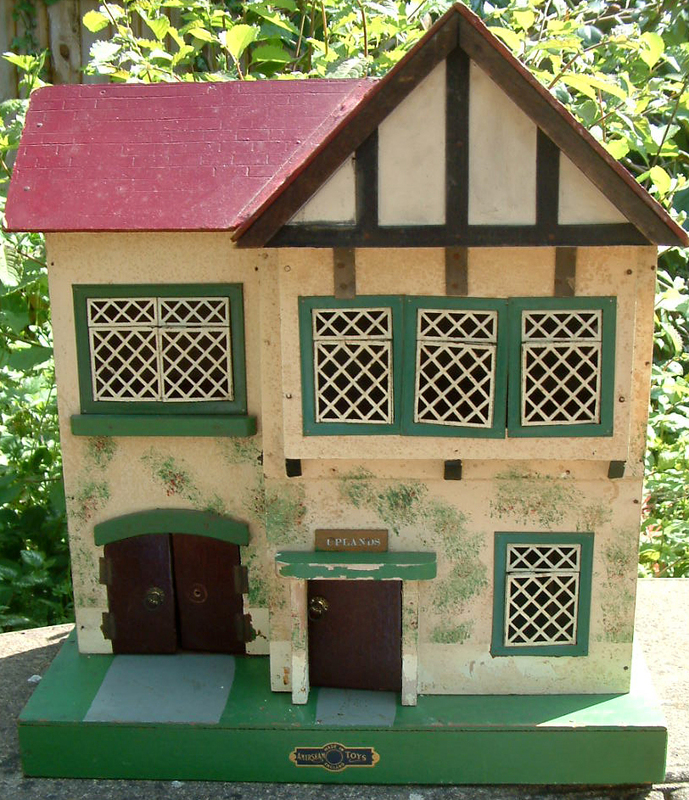 Overall this little house is in a good played with condition although the chimney is missing, the small strip of brick paper is missing from the lower frontage and one handle off the garage door is long gone. But everything else is intact and original. 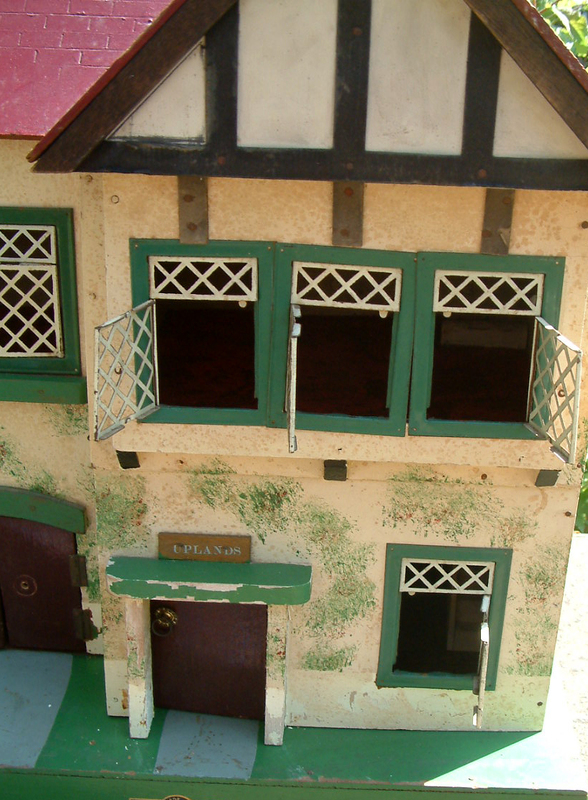 The frontage also catches a tad on opening & shutting which is a common problem found in vintage dolls houses. The original bulb is situated in the downstairs room and the wire leads out of the back down into the base where the battery would have been situated. Sorry but I have to say that as always, this is available to UK buyers only. 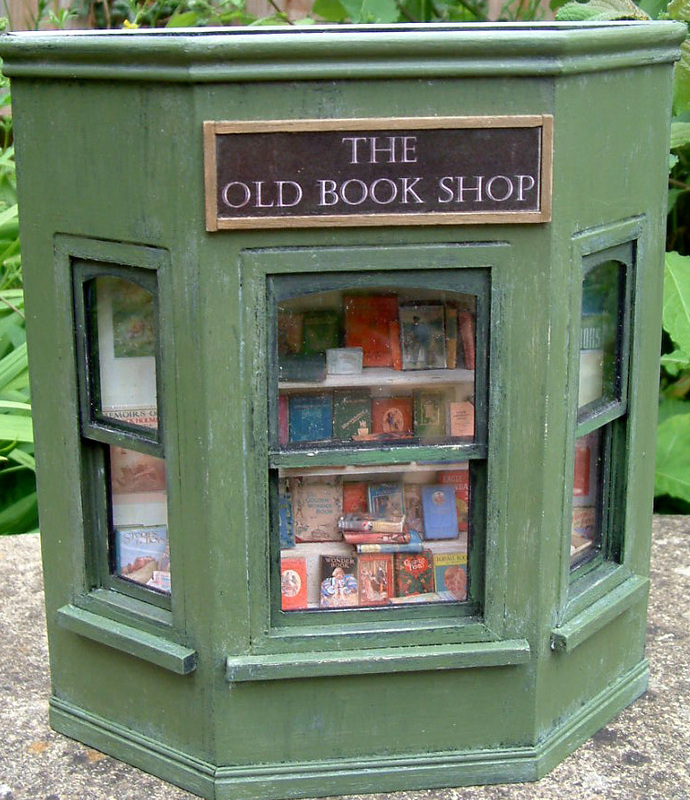 If you wish to purchase this little treasure, you are welcome to collect from me in person at Thame (Oxfordshire) to minimise any risk of damage in transit - alternatively this is small enough to post via Parcelforce. After two glorious bank holidays in a row here - all good things must come to an end I suppose. KT Miniatures may have only been open for just 4 days out of the last 12 but I have not been completely idle during that time....honest! As you have probably guessed from the theme of my joint venture with Robin of Coombe Crafts - Over The Little Garden Fence Workshop (we only have 2 spaces left now by the way) that yep, I do love gardening. Most of the year, my garden takes on a rustic and rambling look - ie. 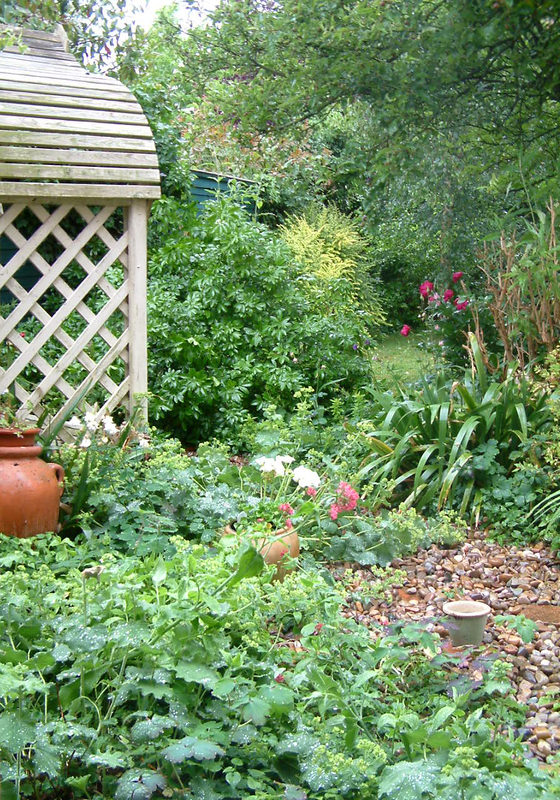 usually in desperate need of pruning and weeding due to lack of time & energy. But I have had no excuse these past few days; digging and weeding I have done in abundance! 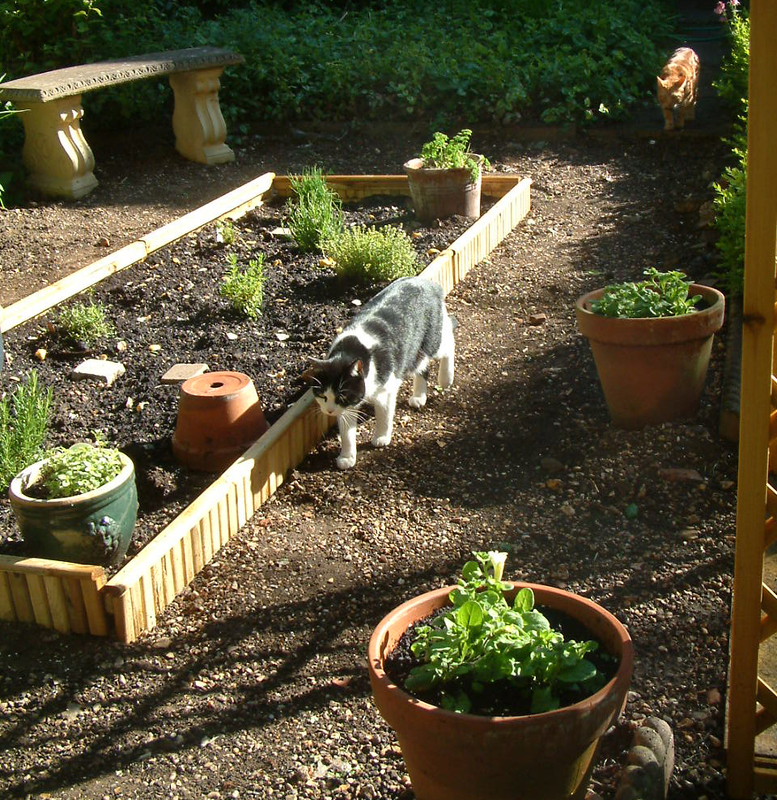 Then in a moment of creativity decided to make a herb garden - something I've been meaning to do for ages. Although it is far from complete - its definitely well on its way. 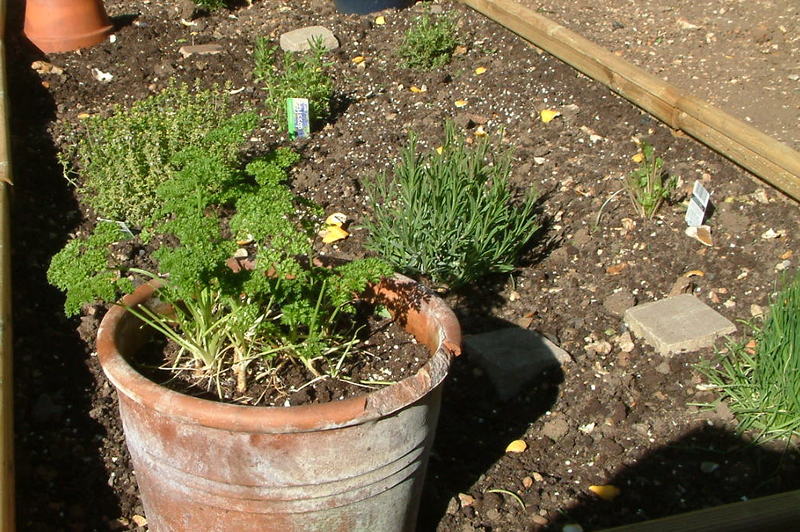 Just like with my miniatures, in real life I love old battered items such as this old terracotta pot filled with parsley. The pot may be aged, discoloured & cracked but I love it! By the way, if you are wondering why there is lemon peel all over the herb patch - let's just say that I have been told that it can act as a cat repellant. Little Freddie thinks that any newly dug soil is his litter tray! Molly (the black & white cat) is much more refined & goes elsewhere....maybe it's a "male thing"! It's still early days but so far so good, it seems to be working. I am also told that lavender and rue is a good deterrent so lavender is lurking in the herb garden already and I am trying to track down some rue. If none of this works then my Plan B will be this new "Scaredy Cat Plant" that people are talking about. Then there's my little secret bit which is my hideaway for chilling out when I want to be on my own. 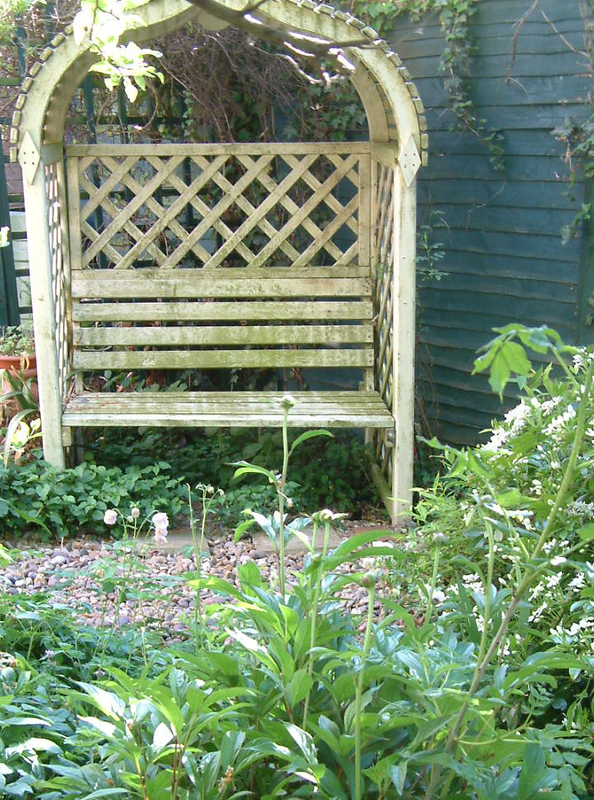 Ok - my little arbour may be ancient & slightly distressed plus lean to one side when I sit on it, but I adore it still. To me naturally aged objects have real character and presence.Yes, it may need yet another lick of paint but it will simply have to wait for now. 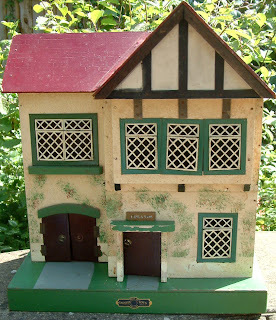 KT Miniatures is now back open for business and I hope to start loading up more vintage items shortly including a couple of dolls houses. I am also about to embark on some "making" so watch this space!